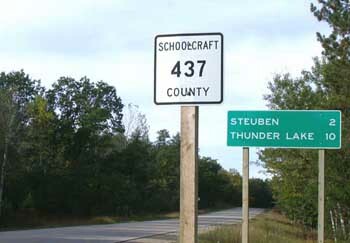 Various methods of numbering and signing county routes in Michigan have existed over the years with varying levels of adoption by the various counties. These county route-numbering systems can be broken down into three groupings: coordinated statewide numbering (1928), individual-county implemented systems, and the Intercounty Highway system (1972). While the Intercounty Highway system is still currently being signed and maintained in some counties and is theoretically statewide in scope, the majority of counties in Michigan at present do not designate or sign their primary county roads by number. Future development of this section of the website will detail the history and present make-up of the county route numbering system from the late 1920s and the individual-county implemented systems. Stay tuned for future additions. See also: Intercounty Highways section.